Now more than ever, the data at our fingertips is ripe for the harvest. But without the proper tools for processing and understanding that data, we would still be in the dark. That’s why data visualization is such a powerful tool. Infographics and gifographics aren’t just fun to look at—most of us literally wouldn’t be able to make any sense of data without them. That’s why marketers should be paying more attention to the numerous marketing charts being produced each month from every corner of the Internet. 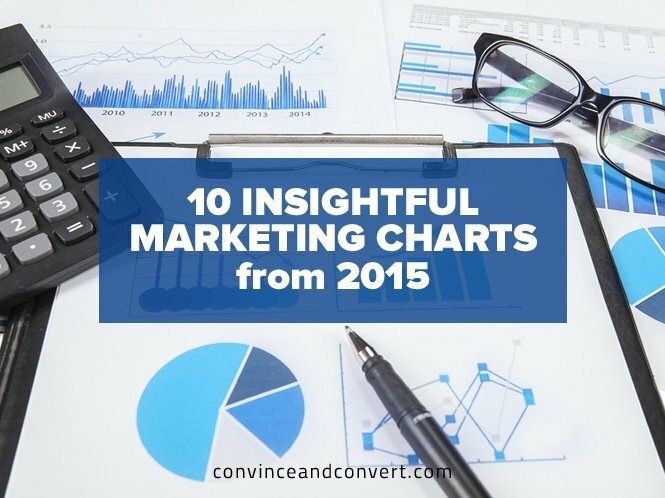 Let’s look at 10 of the more interesting marketing charts to emerge since January 2015, and what they imply for the state of marketing in 2015. 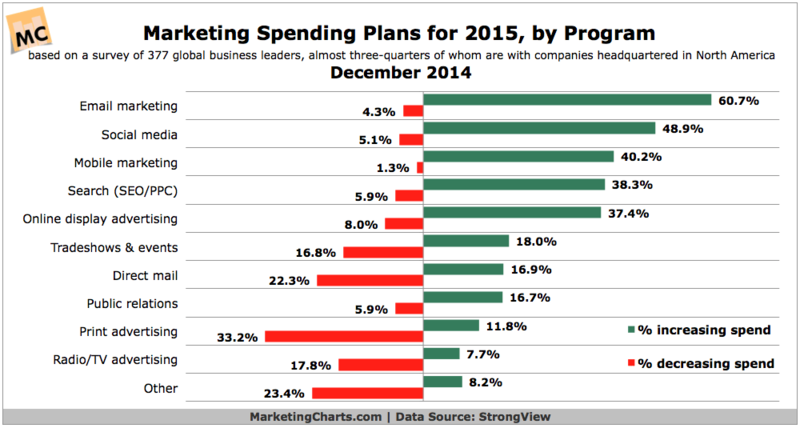 First, let’s look at the state of the marketing world, and where marketers are planning on spending their money. Let’s look at areas of increasing, unchanging, and decreasing spend. As you can see, everything online and mobile-related is ramping up, while anything offline is scaling down. The only exception to this rule is tradeshows/events, which have slightly increased spending. Next, let’s take a look at this massive chart by chiefmartec.com (click on it for a larger version). 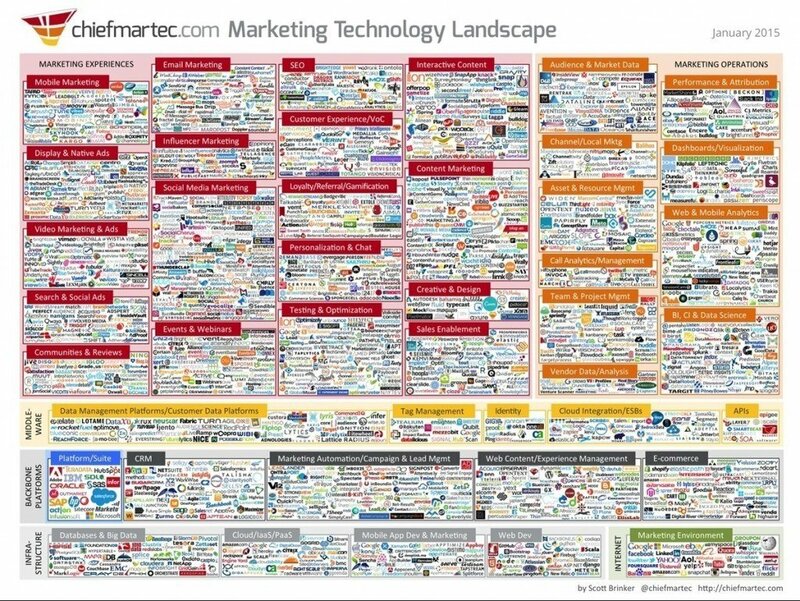 It lists the top vendors in each field of marketing, from mobile to e-commerce. It’s exhaustive, and it should certainly help you choose a vendor for the marketing arena you’re thinking about entering in 2015. Even if you don’t have any plans to sign up new solutions, it’s helpful just to look over the categories to see what, if anything, you could add to your marketing efforts. The first of these two charts shows us what we’d expect to see. Content marketing is still the most popular area of marketing spend by far, with big data, marketing automation, and mobile marketing all in close quarters for second place. Surprisingly, online PR is now dead last. The second chart shows us what we would expect, but gives us one great insight that may not be immediately obvious: Email marketing is by and large the best marketing method. It drives an almost equal percentage of inbound and outbound leads at a very high rate. The trend in recent years has been very inbound marketing-heavy (e.g., social media, blogs, SEO), but hopefully this chart will steer some of that inbound energy back towards outbound email marketing as well. If that isn’t enough to convince you of the importance of email marketing, this should. 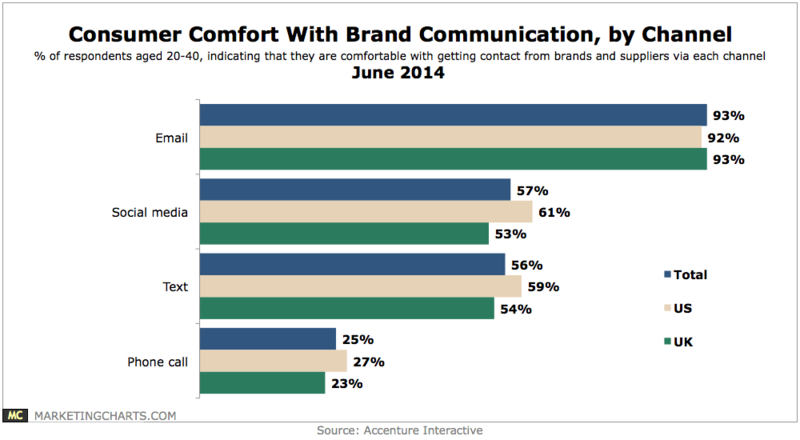 Across the board, consumers report the highest level of comfort when receiving email communications from brands. It’s not even a contest. Social media, which inbound marketers constantly preach, doesn’t even hold a candle to email marketing when it comes to recipient preferences. In fact, it looks like consumers find social media outreach just as annoying as spammy text messages. So, if email marketing is still the most valuable marketing channel in terms of combined inbound and outbound, then what should marketers do to get higher CTR? Unsurprisingly, a meaningful call-to-action offer is still the number one way to get read-throughs and clicks. Segmentation and message personalization are a distant second and third, while A/B testing and mobile-friendly design are fourth and fifth, which is surprising. 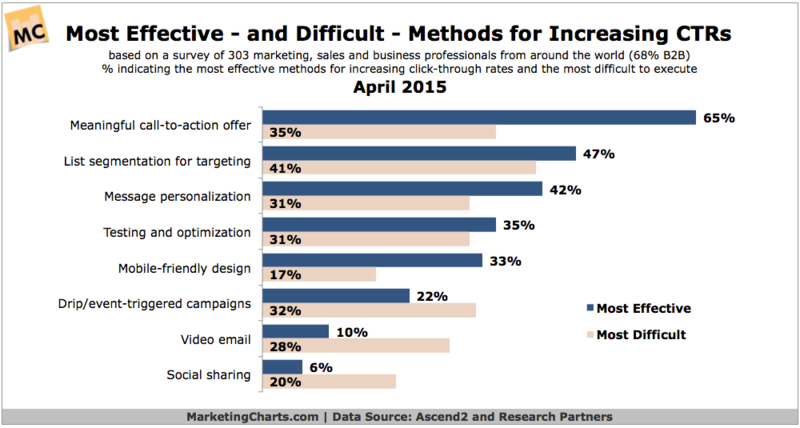 Apparently, drip campaigns and video in emails aren’t worth it—their difficulty outweighs their benefit. 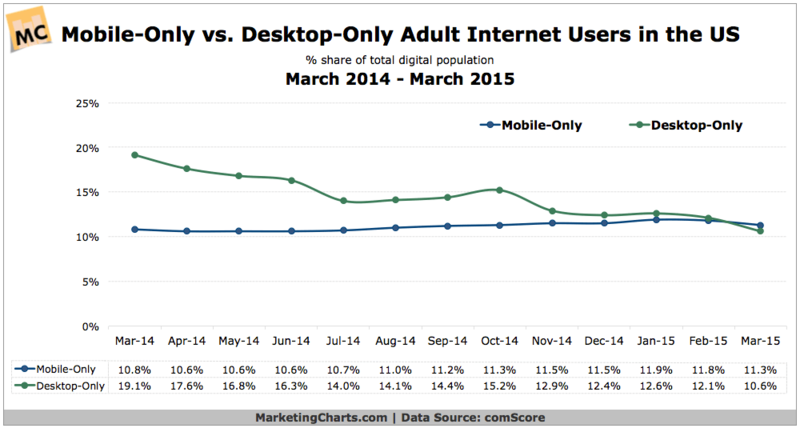 Speaking of lead sources, we all know that mobile users are catching up to desktop users, but I bet you didn’t know that mobile-only users recently surpassed desktop-only users in the US. Not only is this surprising, but it also leaves us with no excuse for sites that aren’t mobile-optimized. Let’s face it: All of us have dawdled when it comes to making a site mobile-friendly. But the weak justification of a desktop-optimized site being preferable to a mobile-optimized site no longer holds with this kind of data staring us in the face. While email marketing is fantastic for top-of-the-funnel inbound and outbound marketing, phone calls are still closers for mid-to-bottom of the funnel leads, especially for B2B businesses. 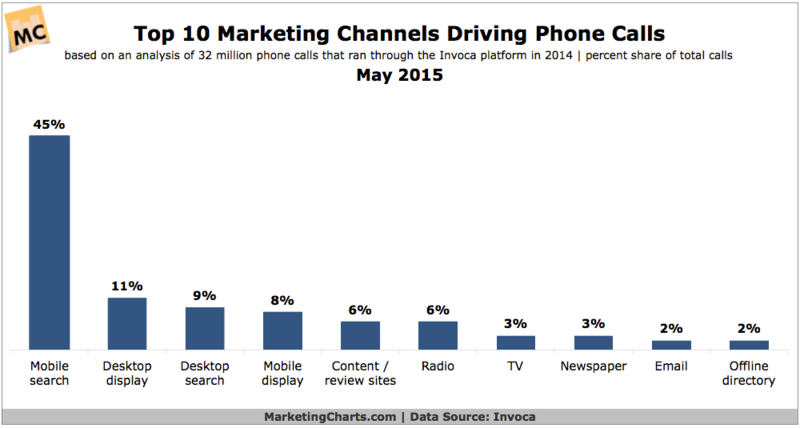 But instead of focusing on ways to get more potential customers on the phone, how can we drive more phone calls our way? By embracing mobile, of course. Mobile search optimization drives an astounding 45% of phone calls to businesses, compared to second place desktop display ads. And because there are now more mobile-only users in the US than desktop-only users, this trend will only continue. I have been painting a fairly one-sided picture in favor of email and mobile marketing, so let me dial back a bit and take a look at the big picture. I mentioned earlier that email is most effective for B2B marketing. This is true. 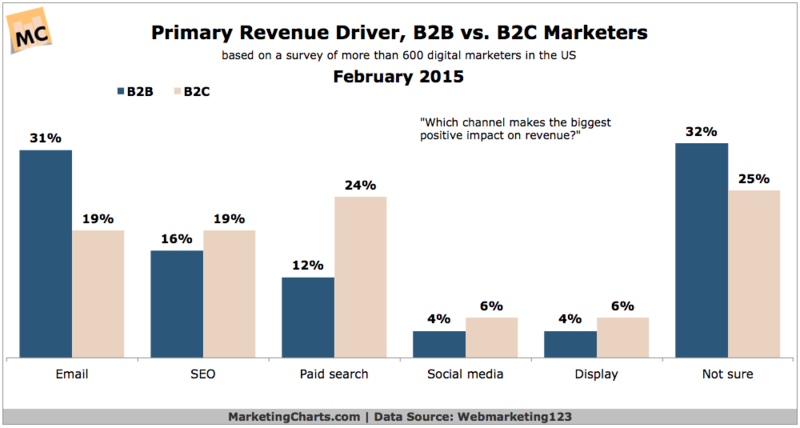 It’s not true for B2C marketing, where paid search is still most effective. But when you really take into consideration the cost of paid search over the cost of an email marketing campaign, those five percentage points of difference may not be as tempting anymore. Email marketing is much cheaper to execute, and ROI is almost just as high. Lastly, let’s not pat ourselves on the back too much. While all this pulled data is great, it’s hard to beat survey data. According to consumers themselves (specifically Gen Xers), personal recommendations are still the most important driver for purchases. And despite the year-over-year decreased spending on TV ads by marketers, consumers still rank TV ads very high. Direct mail clearly isn’t as dead as marketers think it is, either. 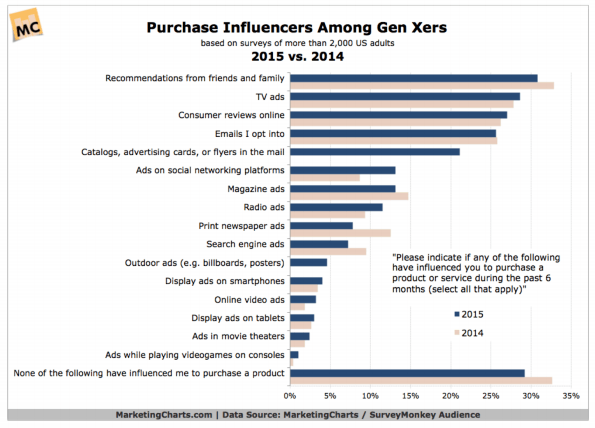 It easily makes the cut and rounds out the top five purchase influencers for 2015.